KANSAS CITY, Mo. 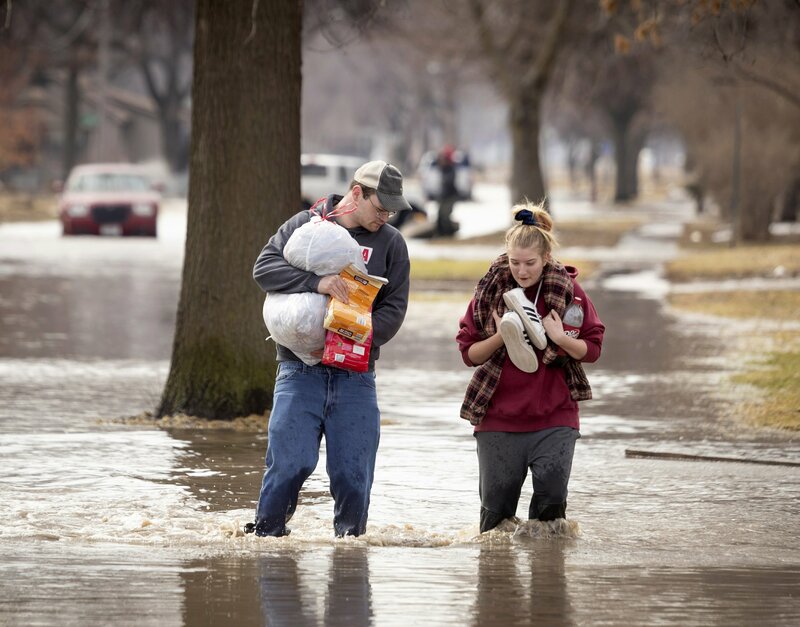 — Hundreds of homes flooded in several Midwestern states after rivers breached at least a dozen levees following heavy rain and snowmelt in the region, authorities said Monday while warning that the flooding was expected to linger. Many homes in a mostly rural area of Missouri’s Holt County were inundated with 6 to 7 feet (1.8 to 2.1 meters) of water from the swollen Missouri River, said the county’s emergency management director, Tom Bullock. He said his own home was on an island surrounded by floodwater. One couple was rescued in a helicopter after water from three breached levees swept across 40,000 acres (62.5 square miles), he said. Another nine breaches were confirmed in Nebraska and Iowa counties south of the Platte River, according to the U.S. Army Corps of Engineers. The flooding started after a massive late-winter storm hit the Midwest last week. At least three deaths were blamed on flooding. Among the victims was 80-year-old Betty Hamernik whose body was recovered Saturday by divers after earlier rescue efforts failed because of the dangerous conditions, the Omaha World-Herald reported.